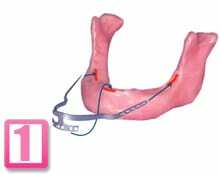 Three incisions are made in the gum and bone in which to place the Ramus Frame implant. (Incisions shown in Red). 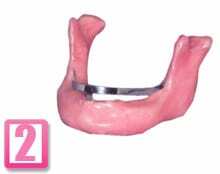 Your existing denture, or a new denture, is secured firmly to the Ramus Frame Implant Rail with a locking device, to give you a solid, secure bite. The Ramus Frame Implant is placed and secured into the three incision areas. 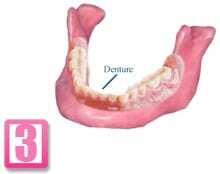 A temporary denture is placed over the Implant, which is allowed to heal over a period between 2-3 months.